That is a really slow start, even for a Zero game. OSS debuted at like what, 34,000+? Then again, Zero collection is a collection, and was advertised as nothing more than that. So it sort of makes sense. Good to hear, I suppose. 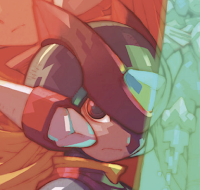 Hopefully, this'll increase the chances of Mega Man Mania finally seeing the light of day. I wonder how many were shipped in the US. My gamestop only got 1 copy of the game and that was my copy that I preordered. I disagree with this Bias list. You have to realize, it beat Dragon Quest Monsters 2. Dragon Quest is HUGE in Japan, color me surprised it managed to beat that game out. I'd say that's pretty good! That was predictable, what´s the surprise? I guess the thing that's perfectly reasonable to assume is that Japanese Zero fans are like Zero fans every where else: you more than likely have these games already, in the original GBA form, and perfectly legit means of playing them. A largely no-frills collection that doesn't add anything to what you already possess is a hard-sell. So, bottom-line, I'm thinking Capcom will likely have reason to be pleased with these sales. 22,000 units for what amounts to a "quickly put together" port collection likely abodes much better than 30,000+ for OSS, which was more of a remake to a game line that's used to grossing in the hundreds of thousands. Where'd you get the picture from?